Explore Harvey Classic windows reviews from our editors on their most popular window model. The Harvey Classic series vinyl replacement window is the company's most popular model and comes in a variety of options that includes 28 exterior color options and 6 interior color options. Similar to the Harvey Slimline window, the Classic has a block & tackle balance system, although the bulkier mainframe will offer more strength and durability. With the Energy Star package that includes grids, low-e and argon fills, the Classic Series achieves a .30 U-factor, STC rating of 28, 3.33 R-value, .14 AI, DP35, .27 SHGC and .49 VT. These are all respectable numbers, but not outstanding. The Classic window is comparable to Anlin Del Mar windows. The Harvey Classic window itself should run anywhere from $250 to $300 for a normal sized double hung or casement. Installation will typically run $50 to $150 per window depending on the condition of your sills and frames. Therefore, the Classic should run $300 to $450 fully installed, depending on the distributor you purchase from. We always suggest getting a few bids - several vinyl window manufacturers to consider include Champion, Amerimax, Okna and Polaris. In terms of performance, the Harvey Classic double hung window with a standard low-e glass and argon fills gets a .31 U-value (heat loss), .37 SHGC (heat gain coefficient), .47 VT (visible transmittance), and a 51 CR (condensation resistance). An upgrade to the better glass package will generate a .24 U-value (heat loss), .22 SHGC (heat gain coefficient), .36 VT (visible transmittance), and a 61 CR (condensation resistance). All in all, I'm impressed with the performance data on the Harvey Classic, this is a solid performer for the price. Harvey Classic windows come with a Lifetime Warranty that covers the extrusion, screens, and all of the components such as locks, balances, sash retainers, hardware, etc. 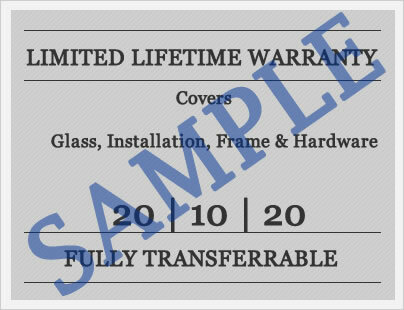 The insulated glass unit carries a 20 year warranty. The warranty is transferrable to one subsequent owner, although the second owner's warranty has only a 20 year warranty period (instead of the lifetime) from the original date of manufacture. Do you have a question about the Harvey Classic? Our industry professionals can help you get more information on pricing, upgrades, installation requirements, contractor quotes, as well as help you sort through the quotes and companies you are considering for your next window replacement project. Want to add your Harvey Classic windows reviews? Post it here and help other consumers get the information they need to make the right choice for their home. Hi - Looking to get our older wood windows replaced to vinyl. So far we had two companies come out for measurement and pricing. Mezzo Alside and the second one was Harvey (Tribute, Classic, or Slimline). Could you let me know which one you would recommend? Jackie, of those two, I would definitely recommend the Harvey Classic. You can go with the Acoustic if you need extra soundproofing, or the Slimline for smaller windows, but I would use the Harvey Classic for the rest of them.